The TECORUNDUM series of non-metallic heating elements are made of recrystallized silicon carbide. These elements are usable at 1,400 and their calorific value per unit area, which is higher than nichrome elements, allows them to be heated quickly. Simple to use and with a long service life, these heating elements are employed in a wide variety of heat treatment applications, including electronic component heat treatment, sintering of metal powders, annealing of wire rods, and melting of glass and other substances. Furthermore, we offer elements whose heated areas are specially coated to allow efficient performance in conditions that would otherwise be harmful. Among these, TECORUNDUM SC is coated with a fine layer of SiC that protects against severe furnace conditions and provides a greater lifespan than that of competitive products. We also produce a grade of TECORUNDUM known as ST, which has improved anti-oxidation properties. The SiC film is pure and dense, and helps to control reactions in harsh atmospheres inside a furnace. Alumina- and mullite-coated products are available. They are ideal for atmospheres in metal treatment furnaces and firing furnaces for oxidized metals. Glass protective coating is applied to curb the oxidation of heating elements. These products are most suitable for use in atmospheres close to the atmospheric air. These products are suitable for large specialized furnaces in which the terminal is pushed in one direction. The same coatings that are applied to bar-shaped products can also be given to hairpin-shaped products. These products are compact and have high thermal values. They are most suitable for aluminum retention furnaces. 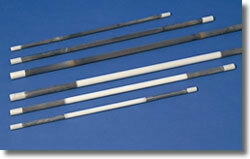 These are heating elements, consisting of cylindrical hollow tubes with spiral slits. As the inside of these heating elements can be used as a heating chamber, large-diameter products are widely used for horizontal tube-shaped furnaces. These have shapes similar to those of SST, with terminals on one end. They are used mostly in vertical tube-shaped furnaces, including small crucible furnaces, volatile matter content measurement furnaces, and thermocoupling test furnaces. These products have slots along the lengthwise direction of bar-type TECORUNDUM heating elements with the terminals placed at one end. In contrast to the spiral type, the exterior of the heating elements is used. They are suitable for operations with small amounts of electric power.